Apparently Senator Obama said yesterday that the Supreme Court Justice he liked least was Clarence Thomas. I’ve met Justice Thomas, Senator, and you are no Clarence Thomas. He is a great man, a humble man, a friendly person who truly wants the Supreme Court to work for the people of this Nation. When I met him he was cordial and shook hands with me, but really wanted to talk to my son, who is in his 20s – he understands how our country needs to grow and develop, with young people with good hearts. I was kind of amazed at how he zeroed in on my son. 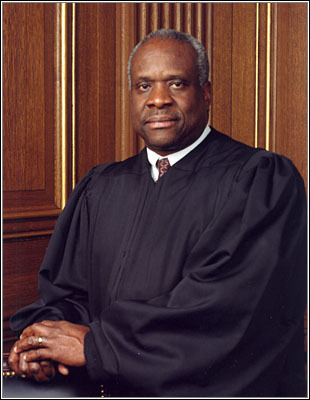 Senator Obama, you should talk to Justice Thomas. Get to know him. Get to know more people like him. Then, someday, you might be qualified to be President. Right now, you’re listening to the wrong people. If we were to elect an African-American as President this year, Justice Thomas would be a far better President than Senator Obama. You are currently browsing the The Old Gray Cat blog archives for the day Sunday, August 17th, 2008.